When NJWeedman Speaks…We Should Listen! Why I’m saying “NO” to current legalization efforts and have called for a boycott. FOR DECADES minorities have had marijuana in their neighbor hoods. There is not a shortage of weed in the hood…if one in the hood wants weed, there is weed. 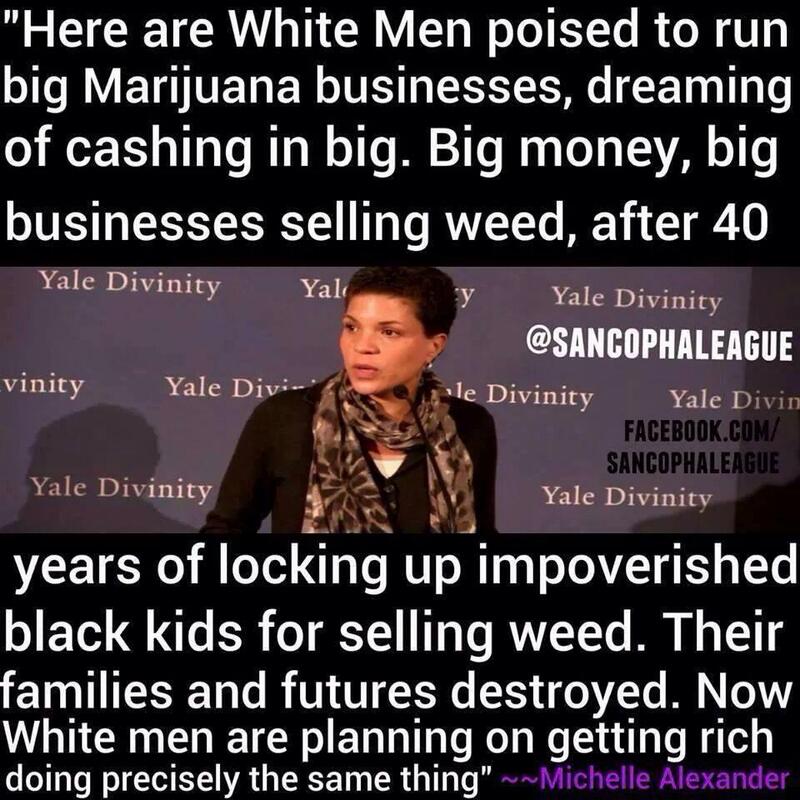 There really is a black-market of weed in minority neighborhoods, weed distribution systems that have been in place for decades. That said and done, now the state is proposing that the hood stop buying their weed in the hood and buy it from the state’s chosen few, none of which are us. WTGanja! The State of New Jersey is seriously now contemplating legalization via a legislative act and instead of really legalizing weed, the government is creating a state sanctioned marijuana industry (a monopoly). This industry, is being formed largely by State Senator(s) Sweeney and Scutari who are taking (bribes) lobbying money from politically connected rich Caucasians who aren’t even part of the marijuana culture. I call them “cannabaggers”. These two politicians and the cannabaggers are making the new marijuana industry laws to cater to these cannabaggers exclusively. I nor most minorities who were victimized by the current marijuana laws can’t participate or even fill out a application for a job let alone ownership in this proposed industry. PLEASE CONTINUE READING ON NJWEEDMANS WEBSITE! NOVA SCOTIA CANADA: Once again it seems that you can’t grow Cannabis and treat licensed patients, even if Cannabis is “legal”. At approximately 10:30am on September 5th, Rev. Daren McCormick and Rev. Kevin James were visited by the RCMP at which time they proceeded to search their property located in Loch Broom Nova Scotia Canada, where they were growing Cannabis for Patients. Rev. Kevin James explained to RCMP that they were licensed plants and who they belonged to. The RCMP produced no warrant yet they proceeded to search both outside and inside their home. They were both incarcerated by the RCMP for growing, and trafficking Cannabis. They both remained incarcerated for 24 hours before being released. Rev. Kevin James was denied medication for seizures during the stay. Over 1000 plants were taken by the RCMP as well as a small indoor grow. Personal items of the two men were taken in the search such as legal documents, witness lists and an antique Bow that hung above the fireplace belonging to Daren’s Grandfather, a family heirloom dating back to 1915 that yielded no threat to anyone. The garden of Cannabis is estimated to be worth well over a million dollars plus and it has been destroyed. You can’t give back a plant that was pulled from the ground in its natural growing state! Above: The Global Incident Map publishes the bust. Above: Rev. Kevin James Service Dog “Molly” was not charged in the raid! I just read the search warrant they used to destroy the plants. AFTER HAVING BEEN CONTACTED BY SEVERAL PATIENTS WE TENDED GARDENS FOR FROM ACROSS CANADA..
#NOMENSREA #IAMTHELAW “When we all say it we all go free”. Thorne Peters has authored nine books, and is working on the tenth one from the Shelby County penal farm in Memphis, TN., He is a songwriter, singer, and human rights activist. But it seems that they can offer him neither pen nor paper in order to work on his case nor to write his book. Thorne Peters currently sits in “the hole” at the Memphis penal farm as he fights for everyone’s rights, #NOMENSREA against Cannabis Prohibition. Below is the latest message from TKP Thorne Peters from the Penal Farm in Memphis Tennessee. Please listen to his message, and then write him a card or letter (address below), and let him know you are thinking of him, as well as all the others who have been unjustly caught up in the drug war, most notably the war on Cannabis! Please listen to entire video! Visit ThornePeters.com and click the ‘420 NITE CLUB BUST’ and ‘CONSPIRACY’ banners to get the story on the now TEN YEAR CONSPIRACY against THE KINGPIN THORNE PETERS that lead to this moment. And last but not least, please DONATE to the “Freedom Fund”! Above: Link to TKP Thorne Peters YOUTUBE Channel. Please follow Linda Harrah on Facebook for updates! REST IN PEACE CHER FORD-MCCULLOUGH…YOU HAVE EARNED YOUR WINGS! FLY HIGH, ANGEL! Above: Left to right: Paula Willett, Gatewood Galbraith, Cher Ford-McCullough. When Gatewood was running for Congress — with Cher Ford-mccullough. At 4:38pm on 6-1-18 Cher Ford-McCullough passed away peacefully, at home with her Children and Brian McCullough, in Iowa. Above: June 22, 2010, Bowling Green KY, From left to right: Mary Thomas-Spears, Paula Willett, Cher Ford-McCullough, Sheree Krider, and front Tonya Davis. This movie is made by the People who support freedom and religion in America.People Like Derrik Decrane, Doug Lienbach, from Rainbow Farm. Gatewood Gailbraith, Kathy Lyons, Dan Klock, Jess Williams AKA. Fat Freddy, Teddy Woodward, Brian And Cher McCullough all fight like wildcats to awaken the masses in a counter attack of ” Propa Ganga”, in the way of Art and Music…Prepare to get Blasted! therealjamesbud – Brian McCullough on Google – There are some very good videos at this link or Cher and Brian. Shawna Fibikar is with Cher Ford-mccullough. We’ve been asked for obituary details to be used for many publications and websites. GoFundMe information will follow yet today to help offset medical costs not covered by mom’s Medicare B and to organize a celebration of life concert in August. Cher Ford-McCullough age 66, died Friday, June 1st, 2018 at her Hopkinton, IA home following a brief battle with lung/liver cancer. It was always said that Cher was born an adult. Her mother once said she wasn’t raised… she was snatched up by the hair of the head. She had responsibility placed on her literally at birth. She helped to raise her four siblings and at the age of 21 and 25 raised two beautiful daughters. As a single mother she worked hard as a waitress and bartender to provide for her kids. Cher might not have been able to afford a big fancy house or nice vacations, but she gave her children unforgettable experiences through her music. Cher was a singer in many bands and found her most success from 1980-1984 when singing for the band Crossbow in Oklahoma City, OK. “Us kids” were drug to many performances, would sleep in “green rooms” while she was on stage and even had an opportunity to perform ourselves a time or two. I, Shawna, can personally attest to a standing ovation from a bar full of people after singing ‘Cat Scratch Fever” at the age of five. Her love for music continued right to the end – she was constantly writing new songs and knew every song that came on the car radio. She was particularly taken in the last year with the song ‘Sign of the Times’ by Harry Styles. Growing up poor, Cher knew what it was like to get bullied for circumstances out of her control. Because of that experience she learned to stand up for herself and others. She wasn’t afraid to stick up for her siblings when they got picked on as kids and this fearlessness continued in to her adulthood when she protested alongside Jesse Jackson after the 2003 Goose Creek raid in South Carolina where police held guns at children’s head in the hallways upon responding to a drug activity call. In the last 20 years of her life she made it her life goal to make a difference and give a voice to those who didn’t have one. She was the founder and president of the Women’s Organization for National Prohibition Reform, Kentucky State Director for the American Alliance for Medical Cannabis, president of Compassionate Moms, a member of the ACLU and the Southern Poverty Law Center, is listed as one of Skunk Magazines top influential women of the cannabis world, funded the Million Marijuana Marches in Paducah, spoke at the Seattle Hemp Feast and 2003 Global Million Marijuana March, participated in the 2004 March for Women’s Lives in Washington, DC, Florida Journey for Justice, Ohio Journey for Justice, Texas Journey for Justice, and worked with long-time marijuana activist and occasional political candidate Gatewood Galbraith since 1999. Her name is listed on the Wall of Tolerance in the Civil Rights Memorial Center in Montgomery, AL, and she actively worked on drug policy and prison reform. She will be sorely missed and survived by her husband of 30 years Brian McCullough, siblings: Cheri Tippets, Lynn Casteel, Billie Clifton, and Bill Morarie, children: Shawna Fibikar, Danielle Ford, grandchildren: Rya (Johnson) Ramsey, Jordan Johnson, Chandler Johnson, Dawson Schmidt, Sebastian Charles and Cecilia Charles. She was preceded in death by her father William Morarie, mother Thelma Healan, a son Robbie who was born prematurely and many beloved pets, some of her most favorite being Katie the raccoon, Woody the squirrel and the many, many ducks and geese that frequented her lake house in Gilbertsville, KY.
A ‘Celebration of Life’ will be held in August, in lieu of a service, that will involve live music, stories being shared and laughter. Details to come via her Facebook profile. There will be another post published this week with more links to history of Cher Ford-McCullough. He was sentenced to 36 months 100% time and 1 yr 30% time … so 39 months. DENVER — Marijuana stores across the country are expected to sell more than $1 billion worth of cannabis as pot enthusiasts celebrate the annual “420” holiday by lighting up in public across America. April 20 has long been a day filled with civil disobedience by marijuana users, who gather in public to light up at 4:20 p.m. The phrase “420” is a code for marijuana users, who work it into dating profiles or post it on signs to show their shared interest. While it used to be a celebration held with a certain level of furtiveness, the rapidly expanding legalization of cannabis means more and more Americans no longer face significant, if any, punishment for smoking pot. 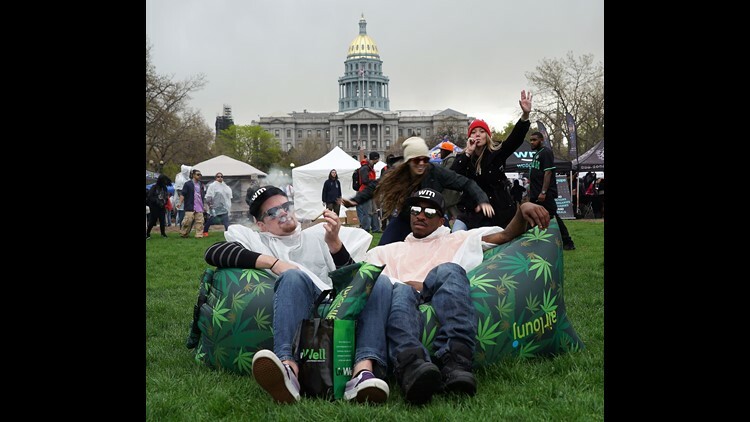 Tens of thousands of people are expected to gather in Denver for what’s considered the world’s largest 420 celebration, filling hotel rooms and packing restaurants during what would otherwise be a quiet time of the year. In advance of the actual event, dozens of companies are offering tours and arranging visits to commercial growing operations, aimed at tourists who fly in to partake in state-legal weed. Denver’s Mile High 420 Festival this year features performances by Lil Wayne and Lil Jon, along with dozens of food trucks. Speidell’s stores are sponsoring a separate cannabis festival in Denver over the 420 holiday. Called 420 on the Block, it’s a three-day music-centered festival featuring Action Bronson and Matisyahu that expects to draw up to 15,000 people. Every year, April 20 is the single-biggest sales day, and the days leading up to it are a combination of Thanksgiving, Christmas and Black Friday rolled into one. Since Colorado became the first state to legalize recreational marijuana in January 2014, participation has risen nationally. Now, nine states and the District of Columbia permit recreational marijuana use, and 30 states permit some form of medical use. LeafLink predicts retailers will sell about $1.17 billion worth of cannabis products for this year’s 420 celebrations, and sales are common. In Denver, Terrapin Care Station, for instance, is offering 1 gram joints for just $5— half off the usual price. LeafLink’s analysis also shows a consistent shift away from loose “flower” marijuana and into branded products. When marijuana stores first opened, buyers flocked to purchase pieces of marijuana flowers, which they smoke. But there’s been a significant shift toward pre-packaged joints and, particularly, branded marijuana-infused foods like chocolate or candy. A large reason for the shift toward products known as “edibles” has been driven by laws banning public marijuana consumption, although those are widely ignored during Denver’s 420 celebration at Civic Center Park, when the mass light up leaves a heavy cloud of pot smoke hanging over the crowd. Edibles are also far easier to travel with, especially for cannabis tourists willing to risk smuggling them back home. At My 420 Tours in Denver, most slots for the company’s upcoming party bus trips are already sold out for the end of the week even through they’ve tripled the number of offerings, said company spokeswoman Cynthia Ord. Tour participants first visit a dispensary to buy marijuana, and then consume it on the bus before visiting grow houses. Ord said about 90% of the company’s customers are out-of-state tourists, largely from Texas and other southern states. The company also offers 420-friendly hotel rooms for people visiting during the celebration, but all 70 are sold out, she said. She said the company hasn’t seen much of a change since California began legal sales on Jan. 1. “Business is as strong as ever,” Ord added. The service Weedmaps, a Yelp for marijuana stores, sees its traffic triple on April 20 each year, with peak time coming from 8-10 a.m. as users “wake and bake,” according to the company. Search traffic normally peaks in the evening, she said. The Colorado State Patrol is planning enhanced patrols around the 420 events; troopers have written more than 3,000 marijuana-related driving citations since 2014, the agency said.